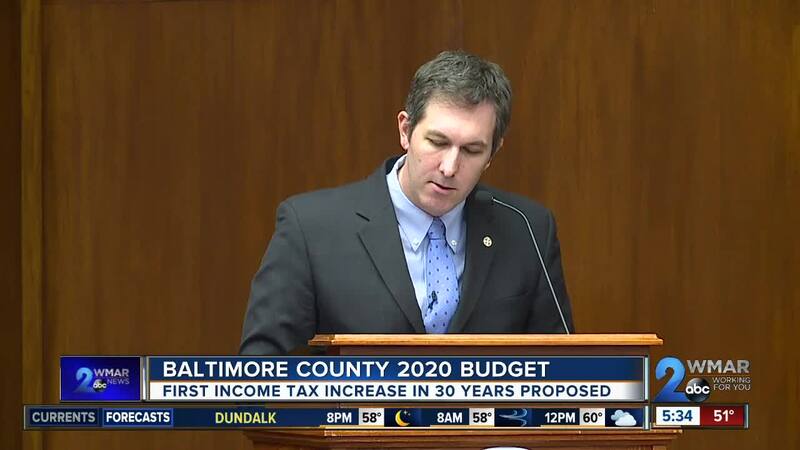 The Baltimore County income tax rate would rise from 2.83 percent to 3.2 percent in an effort to raise revenue for the $3.4 billion fiscal year 2020 budget proposed by Baltimore County Executive Johnny Olszewski Jr. Monday. TOWSON, Md. 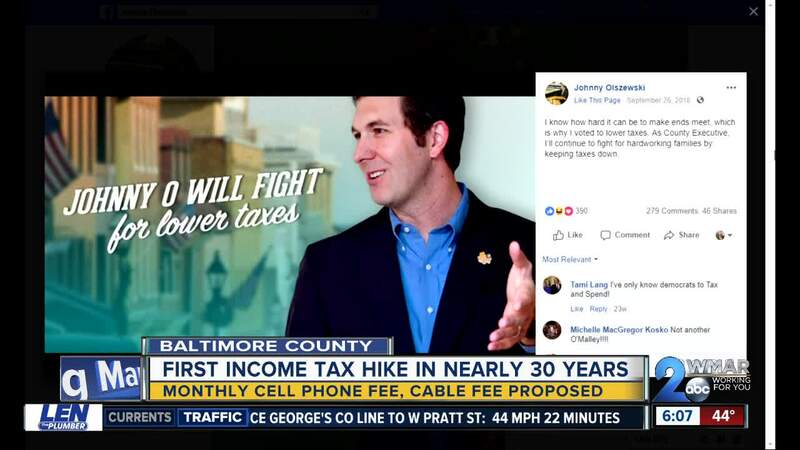 — The Baltimore County income tax rate would rise from 2.83 percent to 3.2 percent in an effort to raise revenue for the $3.4 billion fiscal year 2020 budget proposed by Baltimore County Executive Johnny Olszewski Jr. Monday. Additional fees and tax adjustments have been proposed. The county’s hotel tax would be raised from 8 percent to 10 percent, with short-term rentals like Airbnb being included. A $3.50 tax on cellphone lines aims to replace revenue lost by the decline of land lines. A 1 percent tax on cable accounts will fund Public, Educational and Government programming. Olszewski’s budget focuses on funding for education, economic growth, sustainability, community safety, and accountable government. Of particular note, the proposed budget dedicates $1.8 billion for education. A recent audit of the district prompted the county school board to vote affirmatively to take away $4 million from the school transportation budget , causing backlash from parents. Within the education allotment, Olszewski’s budget proposes a 2 percent cost of living adjustment for county educators in addition to the 3 percent cost of living increase teachers received at the beginning of 2019. The budget creates funds for 70 additional classroom teachers, 50 more special education teachers, 21 more English as a second language teacher, 16 more counselors, 15 additional social works, and four more psychologists. More schools will also have means to provide free breakfast. The county’s share of capital funding for remaining Schools for Our Future projects was also committed, though those projects await the securing of state funds. Money to plan and design of a new Landsdowne High School was included as well. In terms of cuts, $1 million was removed from STAT program devices for students in kindergarten through second grade. In-county tuition for the Community College of Baltimore County was also frozen. "We are grateful for our partnership with the County Executive as we work together on behalf of children," Baltimore County Public Schools Interim Superintendent Verletta White said in a statement released after Oslzewski announced his budget. "Our People for Our People budget is critical to student success. Instructional resources are also necessary to provide high quality instruction; therefore, BCPS will continue to advocate for the tools needed to help teachers ensure optimal student learning experiences." Other highlights include money to start two new school-based Police Athletic League Centers through the Department of Recreation and Parks, $1.8 million to promote county tourism, funds to buy protective gear for each individual county corrections officer, and an additional $500,000 for volunteer fire companies, raising the total of their resources to $1.5 million. To deal with community planning and development, $1 million was included for a first-ever capital project of bike lanes and pedestrian access, $32 million for road resurfacing and curb and gutter maintenance, and $2 million for traffic calming. The Baltimore County Council will hold a hearing on the budget on April 30 at 6 p.m. in Council Chambers. The budget vote is scheduled for May 23.